This is a specialist book for the professional and the serious enthusiast. The quality of illustration is consistently high throughout the book. It is the most comprehensive and authoritative work ever to be published on the colour schemes of the Kriegsmarine, containing the coverage of Volume 1 which took coverage to 1941. This second volume covers from 1942 to 1945. To those wishing to increase their knowledge of WWII naval activity, this is an excellent book, if perhaps at the upper end of the price range for those not yet serious enthusiasts. The publisher has a long tradition of running promotional campaigns with significant price reductions, so all is not lost for those who may struggle to justify the recommended price. The work cannot be too highly commended. DESCRIPTION: This is a specialist book for the professional and the serious enthusiast. The quality of illustration is consistently high throughout the book. It is the most comprehensive and authoritative work ever to be published on the colour schemes of the Kriegsmarine, containing the coverage of Volume 1 which took coverage to 1941. This second volume covers from 1942 to 1945. To those wishing to increase their knowledge of WWII naval activity, this is an excellent book, if perhaps at the upper end of the price range for those not yet serious enthusiasts. The publisher has a long tradition of running promotional campaigns with significant price reductions, so all is not lost for those who may struggle to justify the recommended price. The work cannot be too highly commended. 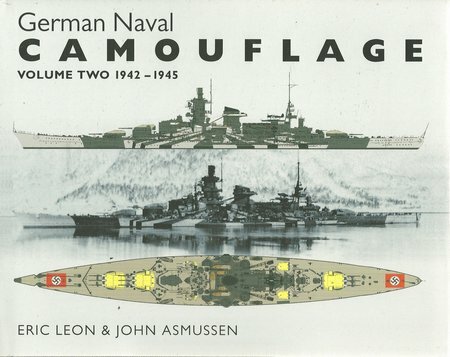 Although the principle objective has been to provide a unique collection of fine art work to show the camouflage patterns used by the Kriegsmarine, there is some very helpful text. The only slightly odd note is that the volume includes corrections for volume one. For serious enthusiasts and professionals, it is a very useful addition because they will already have a copy of volume one and sitting volume two next to it means that the corrections are readily available and bound in a volume so that they cannot become detached and lost. The less serious enthusiast might wonder why a comprehensive and authoritative work should require a number of corrections and then wonder how many errors are present in volume two. In fact, it demonstrates how serious the co-authors are and how they continue to uncover new material or evidence to question an accepted fact.